Tulsi is perhaps the most sacred plant in India and is referred to in the Athurvaveda for its healing and life giving properties. It is a natural antiseptic and useful for skin diseases when applied. externally. For Hair and Skin Care. 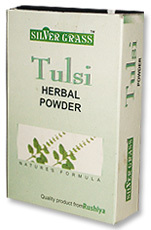 Take 2 teaspoons of Tulsi Powder and 2 teaspoons of Multani. Mix together with Rosewater or Milk and apply on your face wait for 30 minutes and wash.